Reading election tea leaves has never been easy. The Literary Digest 1936 prediction that Landon would crush FDR had the numbers reversed while the new player, Gallup, got it right. Only to get it wrong in 1948 when its newspaper headlines had Dewey defeating Truman. Now, there are more tea leaves than ever and a new niche of polling the polls. There are no fewer than 6 such poll “accumulators”. And, they all agree that Republicans are more likely than not to win control of the Senate in November. The latest is the NYT “Upshot” study of July 27 that gives the Republicans a 60% chance of winning the Senate – up from 54% on April 1. Getting it right in 1936 and 1948 was difficult because polling was in its infancy. Today, it is extraordinarily sophisticated. But, there are two new factors that are wild cards for November. First, is the tsunami of unidentified outside money unleashed by the Citizens United decision of the Supreme Court. Second, is the explosion of social media which deliver instantaneous, unfiltered, unevaluated, anonymous information to an entire nation. A major unknown in the electoral equation is the last minute (“in sight of ballot box”) voter decision. It has been believed that voters had pretty much made up their minds by the end of July. But, the political players can now dump huge amounts of money and social media can inject game-changing messages into last minute campaigning. To add to our uncertainty, at the end of this July the expected Republican wave has not appeared. Obama’s low approval ratings, the bad news about the VA, the botched roll-out of the ACA, Benghazi, the trade of Guantanamo prisoners for Bowe Bergdahl, the flood of child refugees, Russian meddling in Ukraine, slaughter in Gaza, chaos in Iraq are all fodder for Republican attacks on Democrats. But, the polls still show November to be a toss up. The expected Republican killer issue of Obamacare is deflating. It is no longer a daily headline and the news that is published shows that healthcare reform is working. The uninsured rate has dropped 3.7 percentage points since the law’s enrollment deadline and is at the lowest level (13.4%) since Gallup started keeping track in 2008. Moreover, more than half the public either favors Obamacare or opposes it because it doesn’t go far enough. There is also the steady improvement in the economy and a smaller Republican advantage in enthusiasm (determination) to vote in November. That may be influenced by the continuing civil war between the Tea Party and the Establishment wings of the party exacerbated by the defeat of the Tea Party candidate last month in Mississippi. Some Tea Party sympathizers may sit this one out. But, the largest unknown for November is the impact of our rapidly changing demographics. And, the place that will weigh most heavily is in the South where enough Senate seats are being contested to decide its control. Nate Cohen (not Nate Silver!) has an Upshot report on July 18 explaining why black voters in the South could play a pivotal role in November. The closest races are on North Carolina, Louisiana and Georgia. He expects black voters to be more than half of all Democratic voters in the latter two and nearly half in NC. The collapse of the Southern white support for Democrats combined with a rise in black turnout and a reversal of black migration from the South explains the greatly increased importance of the black vote there. Southern black turnout today equals, or sometimes exceeds, that of whites. The end of Jim Crow laws led to a reversal of the Great Migration – the flight of blacks from the racist South. At the start of the 20th century about 90% of African Americans lived in the South. By 1970, and after the Great Migration, that was down to 53%. And after passage of the Civil Rights Act, 57% of blacks live in the South &ndash; more than a million of whom were born in the Northeast. Upshot sees these trends as especially important in Georgia. The white share of eligible voters there has dropped from 68% to 60%. Meanwhile, in the past decade the number of eligible black voters has grown by nearly 600,000 while eligible white voters have increased by only about 375,000. Moreover, since 2000 more than half a million new black voters have registered in Georgia plus another 466,000 other non-white voters while only about 111,000 new white voters have registered. Georgia is, thus, one of only a few states in which there is a larger share of eligible non-white voters who are registered than of eligible white voters who are registered. At this point, the increased importance of the black vote in the South does not foretell the outcome in November. But, it could be a game changing factor in the cliff hanging Senate races in the South. Republican Senator Cochran’s (MS) turn to black voters last month to defeat his Tea Party primary opponent and Libertarian Rand Paul’s open appeal to the African American community in the run up to the Republican Presidential nomination are signs that Republicans are awakening to the potential of the black vote. Another demographic wild card is unmarried women. Half of all women over 18 are unmarried and constitute a quarter of all voting age Americans. And, 2/3 of them voted for Obama in 2012. They are the most reliable Democratic voters after blacks. Their vote could determine who controls the Senate after the November elections. That is why Democrats see Republican opposition to pay equity, the minimum wage, abortion, contraception, Planned Parenthood as issues to get this critical body of voters to the polls. Like the other parts of the Democratic coalition (the young, blacks, the educated, the poor) turnout of unmarried women in mid-term elections usually falls from Presidential levels. If Democrats are to retain control of the Senate, the key is getting this array of Democratic voters to the polls in November. House Republicans are helping out. Speaker Boehner proposed a lawsuit against Obama that was approved by the Republican majority in the House on July 30. His move follows a parade of right wing leaders who have called for Obama’s impeachment since at least 2000. The biggest push came from Sarah Palin in early July. A lawsuit is less red meat for the Tea Party base than impeachment. But, it saves Boehner from having to fight his Tea Party faction that wants the real thing. But, it is also manna for Democrats. They claim that the lawsuit simply opens the way to attempted impeachment. Like Boehner, they remember that the Republican campaign to impeach Clinton backfired. According to CNN’s poll (July 18-20) the public opposes impeachment by 65% to 35%. And that explains the hourly attention that Democrats are giving to the impeachment issue. 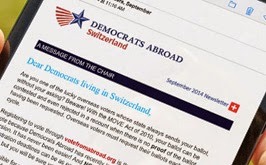 Since proposal of the lawsuit, Democrats claim to have collected some $7.6 million online. According to the Washington Post (July 28), it brought in $2.1 million over the past weekend and that was additional to the half a million dollars after Palin’s demand. Boehner claims that Democrats have cynically invented the impeachment issue and he rules it out. But, if, as expected, the courts reject the House lawsuit against Obama, that opens the way to a House impeachment debate since that is one of its constitutional prerogatives. Whether the House Republicans opt for impeachment or not, the continuing loud public airing of the possibility will drive up Democratic turnout. And that is another wild card for the November elections.